The festival Poet At Large will appear for a special evening reading on Friday, January 24th, and also present to high school students throughout Palm Beach County during festival week. This year’s Poet At Large is Patricia Smith. We anticipate that this program will reach one of the largest festival audiences in our history. It is an honor to welcome Patricia Smith to the festival in this new role to reach an important festival audience including teachers and students beyond the walls of the Crest Theatre. 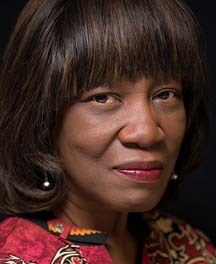 PATRICIA SMITH is the author of eight books of poetry, including Incendiary Art, winner of the 2018 Kingsley Tufts Poetry Award, the 2017 Los Angeles Times Book Prize and the 2018 NAACP Image Award, and finalist for the 2018 Pulitzer Prize; Shoulda Been Jimi Savannah, winner of the Lenore Marshall Prize from the Academy of American Poets; Blood Dazzler, a National Book Award finalist; and Gotta Go, Gotta Flow, a collaboration with award-winning Chicago photographer Michael Abramson. Her other books include the poetry volumes Teahouse of the Almighty, Close to Death, Big Towns Big Talk, Life According to Motown; the children’s book Janna and the Kings and the history Africans in America, a companion book to the award-winning PBS series. Her work has appeared in Poetry, The Paris Review, The Baffler, The Washington Post, The New York Times, Tin House and in Best American Poetry, Best American Essays and Best American Mystery Stories. She co-edited The Golden Shovel Anthology—New Poems Honoring Gwendolyn Brooks and edited the crime fiction anthology Staten Island Noir. She is a Guggenheim fellow, a Civitellian, a National Endowment for the Arts grant recipient, a finalist for the Neustadt Prize, a two-time winner of the Pushcart Prize, a former fellow at both Yaddo and the MacDowell Colony, and a four-time individual champion of the National Poetry Slam, the most successful poet in the competition’s history. Patricia is a professor at the College of Staten Island and in the MFA program at Sierra Nevada College, as well as an instructor at the annual VONA residency and in the Vermont College of Fine Arts Post-Graduate Residency Program.